Late Friday night and into the wee hours of Saturday morning, the long-anticipated assault on clean air and clean water laws began in the House of Representatives. At 4:39AM on Saturday morning, Republicans passed their bill with zero Democratic support, and only three Republican dissenters (Jones (NC), Flake (AZ), Campbell (CA)). The House approved a number of amendments to the budget bill (H.R. 1) that would prevent the EPA from updating rules on mountaintop removal permitting, coal ash storage, emissions of coarse particulate matter, and a variety of other clean air and clean water safeguards. 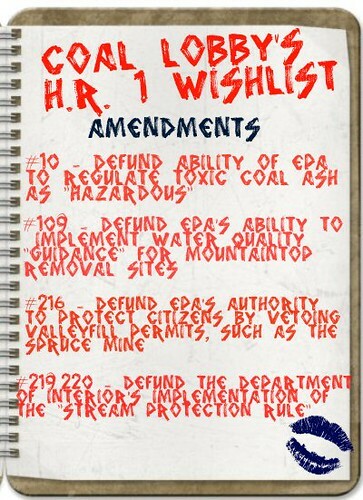 Those amendments that were attached included the coal lobby wishlist of #109, #216, #217 (previously labeled as #10), and #498 (previously labled as #219/220) These were revenue-neutral amendments, meaning they weren’t aimed at reducing the federal budget deficit, but were designed solely to prevent the EPA and other government agencies from updating and enforcing clean air and clean water laws. In short, it was Christmas for polluters. Fortunately, the House version of the budget bill is only the first step, and for any of these rules to take effect, they must also pass the Senate and be signed into law by the President. How did Mountaintop Removal Amendments Fare? Since three of these amendments were aimed specifically at reversing the actions of the Obama Administration to strengthen permitting requirements for mountaintop removal mines (and thus would reinstate the polluter-friendly rules set up by the Bush Administration), we thought we’d provide a break-down of how these amendments faired, who voted for them and who voted against. Appalachian Voices’ supported a “NO” vote on each of the following three amendments. Most Republicans voted “AYE,” and most Democrats voted “NO,” with variations noted below each vote. Appalachian Voices also joined many of our national partners in opposing #217, which limits EPA’s ability to regulate toxic coal ash. Compared to the mountaintop removal amendments, #217 passed with much greater Republican support, but also lost many more Democrats. Though these votes didn’t go the way we would have liked, we have now seen 206 members of Congress take an anti-MTR action by either cosponsoring the Clean Water Protection Act, or voting “NO” on #109, #216, or #498. It does allow us a clearer picture of where many in Congress stand regarding mountaintop removal, and presents a more clear of who we can work with. Several Republicans voted with us at least 3 times. We also have a better picture of Democrats who voted incorrectly 3 or more times, and who will need to hear from their constituents about why mountaintop removal needs to end. Senate Democrats have been VERY cool to the House Republicans budget, and that was before many of these amendments were passed that not only endanger public health and the environment, but according to some studies would cost more than 800,000 jobs. It is clear from this proposal that House Republicans are committed to pursuing an ineffective approach to deficit reduction that attempts to balance the budget on the back of domestic discretionary investments, which constitute only a small percentage of overall federal spending. Any effort to limit EPA’s authority “will not be accepted in the Senate. It’s not even in the ballpark. Appalachian Voices will continue engaging with key targets in the Senate and the national base of support for ending mountaintop removal to ensure that he language from the coal lobby wishlist is not included in the federal budget. We’ll have much more to come this week, including details on what will happen when the Senate returns to finalize their budget. Finally, I just wanted to say a personal word of thanks to the thousands of people who are participating in this fight by calling their Representatives and encouraging their friends and family to do the same. We will all have to work even harder to ensure that these amendments are signed into law and will be asking folks to call key Senators in the upcoming days and weeks. Because of all of your hard work, we were able to convince roughly 200 members of a very hostile Congress, including 18 Republicans, to act against mountaintop removal. Feel free to leave questions in the comments, and thanks for all you do. I’ll leave you with a video of John Yarmuth, defending Appalachia on the House floor. The We Love Mountains Tour is a Wrap!